My own experience with healing began as a spontaneous activity during the French campaign of May 1940 and was entirely brought about by the lack of medical facilities in my unit. Horrified that men were being wounded and were without the comfort of anaesthetics or trained medical personnel, I felt impelled to put my hands on them. I did not have a great deal of time to think about what I was doing as the pressure forcing us back to the coast demanded all our concentration. It was only later, therefore, that I could feel real surprise at the results: haemorrhaging had been arrested; we had no morphine, but when I had put a hand (or two if I could spare them) on a wounded man, pain had started to ebb immediately; the effects of shock and exhaustion seemed to have been minimised. The results were remarkable and persistent and to me both fascinating and extraordinary. It was not something which I could ignore. In the heat of war, I felt a duty to pursue the matter and used my hands whenever necessary. This happened in various circumstances, including the bombing of Britain, accidents during training during the years 1940-42 and thereafter in an infantry division in North Africa and in Italy. I discovered that both I and the person I was treating could feel a variety of reactions. Most people reported a marked change of temperature. Normally they felt heat greater than one would expect from the mere touch of a human hand, but sometimes they would tell me they had experienced intense cold, almost as if a cold wind was blowing on the area I was touching. Sometimes the pain was so great that the patients could not bear being touched and I would have to hold my hand a little away from the wound, but the temperature change could still be felt. Occasionally, they would report a tingling feeling like pins and needles, or throbbing. Others felt that the pain intensified initially and then diffused and seemed to drain away. Sensations recorded less frequently have included a feeling of pressure as though the healer were leaning on the patient when, in fact, there may not have been any physical contact, and indeed very recently one patient exclaimed about the pressure on her chest when my hands were lightly touching her back. Since the war years, I have compared notes with thousands of people and these various reactions seem to be widely shared. Some healers can feel in their hands what is going on. Others feel nothing with their hands but can sense what is happening, sometimes by feeling the pain or illness in their own bodies. This happens to me on occasions. It can be extremely awkward if you are sitting at a dinner party and you develop a very painful knee or an appalling headache which you may be picking up from your neighbour. During the war, my healing activities, which of necessity were carried out in my spare time, were mostly concerned with helping the wounded, so that it was usually obvious where I should put my hands. Sometimes I would find that reaction to my hands was not limited to the wounded area and by moving my hands slowly and gently around, I could find a line of reaction away from the wound. This could be helpful in the case of shrapnel wounds as I could trace the damaged tissue when the offending bits of shell had lodged themselves in the body some inches from the point of entry. Using my hands as detectors, I found that I could scan the body and could find other areas of pain or damage Ä pulled or torn muscles, strained backs, fractured bones and the like. Increasingly, I found that the back seemed to be particularly sensitive even when there was no obvious damage to that area. I would find that I would have to keep my hands for a long time on some point on a patient’s back before the reaction faded and frequently the patient would report that a symptom elsewhere, such as a headache, pain in the knee, a numb finger, would disappear. I began to wonder if there was a relationship. On occasion, I tried to help men who had not been physically wounded but were suffering from nervous exhaustion and various forms of tension which were generally summed up as battle fatigue. Very frequently I seemed to be able to help them so that they could go back into action very quickly without recourse to prolonged psychiatric treatment. As I did not know what to do when confronted with someone who had no overt injury, I would merely scan with my hands until I found a spot where the patient or I or both found a reaction. In every case, I found, amongst other reactions, a precise point in the spine at the level of the fourth and fifth thoracic vertebrae. This happened so consistently that I could not accept it as coincidence. Could there be specific physical areas related to nervous disorders? This seemingly extraordinary hypotheses became for me inescapable fact when, over the years, I found that the majority of patients suffering from nervous disorders, including major psychoses such as schizophrenia and obsession, have a lesion, whether painful or not, at the same point. The word ‘psychosomatic’, recognising the interaction between the ‘psyche’ and the ‘soma’ (body) gave me an inkling in those early days. If we are not just our physical bodies but a multitude of non-physical characteristics which have to express themselves through the body, there must be some point of interaction. The main conductor of energy up and down the body is the central nervous system, which is housed in the skull and the spine en route to the consumer unit, which might be a muscle, organ, gland or any other part of the body. It is my belief that it is this central nervous system, housed in the spine, which is the main area of interaction between our physical and non-physical attributes. In emphasising the significance for me personally of the spinal cord and its associated neural network, I am in no way turning a blind eye to that important part of the central nervous system which is supraterritorial Ä the brain. This is the happy hunting ground of psychologists and hypnotherapists who, in their turn, give only indirect attention to the rest of the nervous system. Each to his own natural bent! My main purpose is to stress the importance of the central nervous system and hence the spine to both our physical and non-physical health. © Bruce MacManaway, 1983. This book may be quoted from and printed out in single copies only for personal use and study, without permission. For publication on websites or for printing in larger quantities or for commercial gain please e-mail Patrick MacManaway for permission. Despite that fact that science is forcing us to re-examine the old views of what is possible and what is impossible, the traditional authorities on healing, namely the medical establishment and the Church, understandably regard any claimants on their preserves with caution and suspicion. This is not true of individuals within these institutions and I have been privileged to work with many doctors and clergy of all denominations over the years and have been immensely grateful for their co-operation and help. The hierarchy of the Church of Rome has been especially sympathetic towards healing in my experience. I first came under the Vatican’s eye in 1946 when I was stationed in Rome and spending a great deal of my spare time working not only with my fellow British but with many Italian families I met. The Jesuit who investigated my activities took the matter up with his superiors. I was thrilled beyond measure to be told ultimately that I might inform any Roman Catholics who had doubts about coming to me for healing that they could write for authority to the Vatican, as Pope Pius XII had taken a personal interest. I was delighted and grateful to find similar encouragement when I was again in Italy in 1957, attached to an Italian regiment. Once again my healing activities had brought me to the attention of the Catholic authorities. One thing led to another and finally I was privileged to meet the then Archbishop of Venice, later to become Pope John XXIII. He too told me that any Catholics in his diocese who were worried might write to him for authority to come to me for healing. I found the same tolerant, understanding attitude in this country when the late Monseigneur Ronald Knox signified to a Roman Catholic priest of my acquaintance that he would give similar authority to any Catholic who wrote to him. Unfortunately, neither the medical nor the religious authorities in this country have carried out any official research into lay healing on a significant scale in recent years. It is perhaps a little unfair to bring up reports that were produced nearly thirty years ago but as they are still frequently quoted, I would like to give my side of the story. It was in 1953 that the Archbishops of Canterbury and York set up a Commission on Divine Healing (they later dropped the word ‘Divine’) with the help of some specially appointed doctors. I was involved with this and with a similar BMA commission and found both of them equally frustrating. The doctors appointed to carry out the research by the BMA started by asking the various healers they were supposed to investigate to produce the medical records of any patient they wished to put forward as an example of successful healing. I do not know if you have ever tried to obtain possession of your own medical records, far less those of anyone else. They are the closely guarded property of the patient’s medical advisers, and a healer does not officially come into this category. Those of us who had been asked to participate and had willingly put ourselves forward for examination promptly pointed out that we would be unable to produce the official records for reasons well known to our examiners. We suggested that, instead, the examining doctors should themselves carry out some studies of patients before and after treatment and liaise on an official professional basis with the patients’ doctors. Our suggestion was not taken up and we were told that if we could not produce medical records, further research was impossible. Similarly, the Church Commission apparently did not follow up any of the cases put forward by the healers, or check the records which they (but not the healers) could so easily have done. The two commissions concluded that any cure or partial cure that is claimed to have resulted from healing is in fact due to wrong diagnosis, wrong prognosis, suggestion, remission or spontaneous healing. The two latter explanations are surely only ways of saying that something has happened but no one knows why. evidence to see if, by any chance, spontaneous recovery happened more frequently after healing than coincidence would allow. Airily to dismiss any medically inexplicable cure or healing as the result of suggestion is surely unfair. Medicine is already well aware of the fact that belief or ‘suggestion’ can make people better. If someone believes that pills from the doctor will cure their symptoms, then time and again pills from the doctor will do so Ä even if the pills contain nothing more potent than sugar and colouring. But why does this happen? We recognise this so-called ‘placebo effect’, but we underrate it. Surely the vital point is that health is restored and the fact that we do not fully understand what triggers off the individual’s own healing processes is bad for our intellectual egos but of secondary importance. If it works, then the patient is happy even if the physician is puzzled, so long live the placebo. It is highly probable that healing sometimes works on the placebo principle. Undoubtedly, one is off to a head start if the patients themselves believe they are going to get better, whatever the basis of their belief may be. Some may already be sincerely religious and feel that God can heal them through someone else. Many come for healing because they have found themselves on the medical scrap-heap and make themselves believe in healing as a desperate last resort. The placebo effect undoubtedly cannot be ruled out of healing, just as it cannot be ruled out of orthodox medicine. I say again, if people get well, God bless the placebo. This is not the whole story, however. Experiments with encephalographs which I will describe later in this chapter indicate that healing can bring about changes in the patient regardless of the patient’s attitude, short of aggressive non-co-operation. In addition, I have frequently been surprised by the speed with which small pre-language children and animals will respond to healing. They obviously cannot believe in anything, although the child can respond to feelings from the mother and the animal to its owner, and I suspect that if the mother or owner felt reassured this could be transmitted to the patient. I am not at all sure where the Church of England now stands officially in its attitude to lay healing. The Churches Council for Health and Healing is doing valuable work. It is also exciting to see so many healing guilds springing up within the churches of all denominations and to hear of the dedication and success of healing services. The doctors’ professional association, the BMA, still takes a fairly hostile approach to healing. In their 1980 handbook it is flatly stated that doctors should not refer patients to osteopaths and by implication to any other practitioners of ‘alternative’ medicine. On the other hand, the General Medical Council, which is established by law to oversee the medical profession, takes a more tolerant view and does not restrict connections with ‘alternative’ practitioners  This position was reiterated in the recent report of the Royal Commission on the National Health Service. In June 1981, I myself received a letter from the General Medical Council. It referred to the Council’s Guidelines on Professional Conduct and Discipline in relation to the delegation of treatment to nurses or other persons who have been trained to perform specialised functions. While it is clear that the Council does not consider healers to fall into this category, the letter states that it is ‘open to a doctor to suggest or agree to one of his patients seeking assistance from another source which he feels might be of benefit to the patient provided that the doctor himself continues to give, and to remain responsible for, any medical treatment he considers necessary for the patient and is able to ensure that there is no interference with the treatment which he may have prescribed in the case.’ I have never regarded healing as in opposition to medicine but as a useful supplement. I am therefore delighted that at least it is now officially permissible for doctors and healers to work together. I can understand the authorities’ reluctance to give blanket acceptance to lay healers as there is not enough official verification of their effectiveness. Such a statement rather begs the question of why more official research has not been carried out. More and more healers are appearing in this country. One would have thought that no one would go to a healer except as a last resort and the fact that increasingly large numbers of people are doing so surely raises a number of points. Is the population becoming more gullible? Is the medical profession so overworked that people go elsewhere? Does healing really help large numbers of people? I must make a strong plea that more official research is badly needed, including extensive ‘before and after studies’ of patients who have received healing. One of the difficulties from the point of view of anyone trying to assess healing is the lack of consensus on theory. There are almost as many variations in and theories about healing as there are practitioners. While numerous healers will agree on certain points, they may each have their pet theories and their own specialities. Perhaps the most important factor that is recognised by most (but not all) of the healers! have met is the existence of some force or some energy outside themselves that they can channel but for which they are not responsible. If the healer is only a channel, he cannot claim for himself the credit for any cures or assistance he may give. Opinion varies about this force that is channelled, so that healing has been given many names spiritual healing, faith healing and magnetic healing being the best known. In the case of magnetic healing, the theorists would not claim any form of consciousness behind the force they use, but they may nevertheless recognise some external factor which they can feel and use. Recognition of some external force is not essential, however. Many healers do not think they are ‘channels’ and are nevertheless very effective. Once again, while my own beliefs are important tome, I prefer to leave them out of my definition of healing because I cannot stress too strongly the fact that healing works, regardless of belief. For this reason, I prefer to stick to the plain term ‘healing’ without any descriptive prefixes. Many healers use therapeutic aids to supplement their healing gift or concentrate on one particular part of the body as the key to the general health of the patient. Therapeutic aids range from colour and light to herbal remedies and gems. Any or all of these may have ‘objective’ therapeutic powers, scientifically proven or otherwise. Parts of the body that receive attention include the eyes (iridology) and the feet (reflexology). I myself pay particular attention to the spine and, like anyone with a pet theory, I will go to great lengths to insist that the spine, or more properly the nervous system housed within it, is vital and the most important factor of all. I suspect that what matters in all of these methods is the individual’s capacity as a healer as much as the aids or therapies that he uses. Any or all may indeed have objective validity, (and I shall certainly claim objective importance for the spine), but I still maintain that the practitioner is more important than the practice. 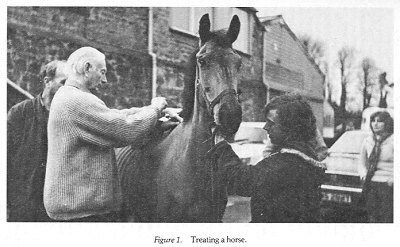 I have seen Harry Edwards correct spines, free seized-up joints and alleviate all manner of conditions by no more than putting his hands on a patient. Healing, at its simplest, is merely a reaction between two or more persons. You may well say that this is not anything very new or original. We all know people whose mere presence cheers us up (or the reverse! ); it may be their sheer exuberance, their personality, or some other factor which we do not bother to define. The reaction they can induce is neither as vague nor as undramatic as it sounds. Current slang provides a pointer. One hears the expression ‘good vibes’, or we talk of finding ourselves ‘in tune’ with someone. This is symbolic language, representing a reality which is not yet fully understood. Our sense of touch is enormously important to us in establishing our understanding of the world around us. It is also a means of communicating. While it is perfectly possible for a reaction between two people to happen, regardless of physical proximity, touch does help. The laying on of hands is probably the oldest and simplest form of healing. We still retain vestiges of it in its simplest form in that, if a child is feverish, it is instinctive to smooth his brow. Sometimes, this is all that is required to calm the child. If not, we call the doctor. Between the mere stroking of a child’s brow and the miracles of Jesus, there is a great gulf, but they are both, I think, extreme examples of some healing capacity in man. Unfortunately for the rest of us, there are very few healers in any age who approach Jesus’ abilities. This is not to say that supposed miracles are gone forever; Jesus was, after all, the Son of Man, and He did emphasise that we should go and do greater things than He. For most of us, however, a middle way must be sufficient, and while the laying on of hands can do a very great deal, we need to make use of the therapies and the vast medical knowledge as well. What actually happens when a healer places his hands on a patient? Some research work into healing involves the use of encephalographs, machines which monitor the rhythms of electrical activity originating in the brain. I have been privileged to work in the last five years with Maxwell Cade, one of the foremost researchers in this field. As a fellow of the Institute of Electrical Engineers, a member of the Institute of Physics, a member of the Institute of Biology, a fellow of the Royal Society of Medicine and an Honorary Member of the National Council of Psychotherapists, he is peculiarly well qualified to co-ordinate the many highly technical skills required for such research. He has tested numerous healers in this country and has found that they produce a very unusual brain wave pattern when they are working with a patient. More surprisingly, they impose the same pattern on the patient, a pattern that the patient cannot produce on his own without special training. This conclusively demonstrates the reality of healer and patient ‘tuning in’. While it is of interest to discover that healer and patient do get on to the same wave-length, so to speak, it does not get us very far unless the particular pattern can be associated with beneficial physiological results. Maxwell Cade, Dr Ann Woolley Hart and many others have for some time been exploring the possibilities of measuring sensitive physical and mental reactions and have developed a. variety of machines which give an immediate reading. Work in this field goes under the general term of biofeedback and the basic principle is very simple: if one is physically enabled to observe some biological happening in oneself, of which one is not normally aware, then one can be trained to control that happening. This has enormous implications for self-help, (in reducing one’s own blood pressure without drugs, for example), but from the point of view of research into healing, it means that a feeling of healing can be seen on these sensitive machines to have a physiologically measurable correlate, and provides a subjective feeling with supportive objective evidence. It is not only the patient’s brain wave pattern, induced by the healer, which can be assessed, but also his electrical skin resistance (a measure of arousal) and the electrical impulses associated with muscle tension. – reduction in: heart rate, respiratory rate, blood pressure, blood lactate, muscle tone and blood cortisone levels. The unusual brain wave pattern (labelled by Cade as ‘State Five) is associated not only with deep relaxation but with bilateral symmetry of brain function, which he claims seems to be central to health control in general. In conclusion, I think we can now say that the reaction between healer and patient does seem to impose certain beneficial and physiologically measurable patterns. The conclusions so far attained through biofeedback research have recently gained some unexpected support from another research group. Dr Joe Navach, M.D. who has been studying the Auricular Cardiac Reflex (an autonomic or supposedly involuntary function), made some startling discoveries with a new machine designed to record the reflex. Made by NASA and acquired at enormous expense, it is a masterpiece of sensitive technology. It was a shock to find that, as Dr Navach claims, the person working the machine can affect the reading and can ‘think’ a positive Auricular Cardiac Reflex onto the patient being tested. In other words, if the machine operator is a healer (a fact of which he may be totally unconscious) the results will quickly show up on sensitive instruments; this can lead to horrible complications for those who want to make purely objective measurements! 2. Cade, C. Maxwell and Coxhead, Nona. The Awakened Mind. Wildwood House, London, 1980. 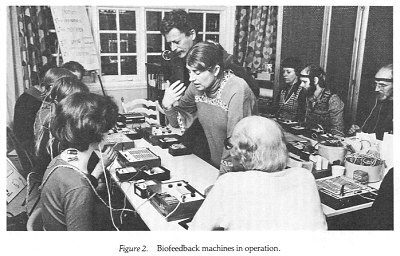 Note: Biofeedback is a relatively new and very complex field and it is necessary to point out that there is some disagreement amongst the researchers. I have not, unfortunately, been able to trace published material, but Lee Sannella and Jean Milay are amongst those doing valuable research in the United States. 3. Benson, Herbert. The Relaxation Response. Fount Paperbacks, 1977. 4. Novach, J. H. 1980. ‘Infra-red photo pulse sensor and doppler investigation of the autonomic vascular system.’ Seventh German-Latin Congress of Acupuncture and Auricular Therapy, Palma de Mallorca, Spain. Bruce MacManaway stresses that, while healing can and does achieve astonishing results, it should not be seen as a substitute for existing medicine, but rather as complementary to it, and he emphasises the importance of wholeness. The late Bruce MacManaway was a young army officer during the French campaign in 1940 when he first discovered his power to remove pain and help the wounded. In 1959, together with his wife who is similarly gifted, he set up the Westbank Healing and Teaching Centre in Fifeshire, Scotland. He broadcast several times on BBC radio and TV and also taught throughout Europe and USA. Johanna Turcan studied history at Oxford and obtained her degree in 1970. She became interested in healing and the MacManaways’ work in 1972 and subsequently spent a year studying at Westbank. She has been interested in healing ever since. © 2018 Spirit Discovery. All Rights Reserved.